I love buying gifts for my friends and family. Nothing makes me happier than seeing a smile on their face and surprise in their eyes after they opened a present from me. I am always looking for something unique and quirky, something uncommon! 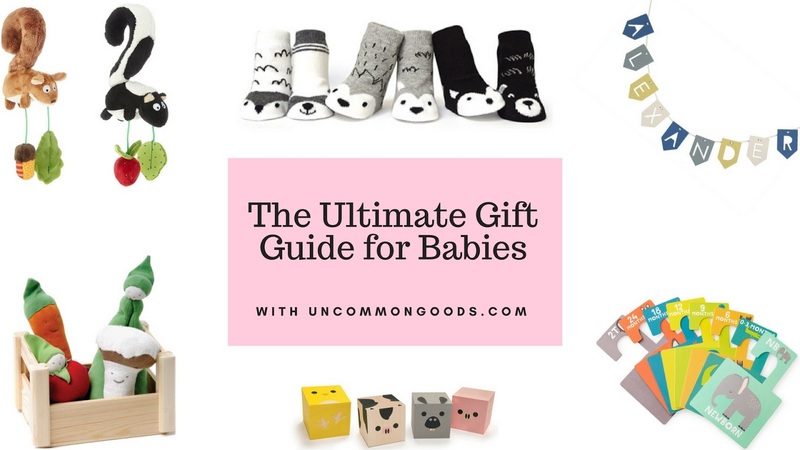 I have themed up with UncommonGoods and created the Ultimate Unique Gift Guides: for babies, for kids, Christmast gift guide for men, Christmas gift guide for women and the Ultimate Personalized Gift Guide. I hope you find them helpful when shopping for gifts for your loved ones! I love UncommonGoods for several reasons. First of all, they offer a wide range of products, all of which are beautiful and unique. Many of them are handmade and contain recycled components. As a vegan, I truly appreciate that they care not only about people (offering excellent service to their customers and fair pay to their workers) but also about animals. They do not sell products containing feathers, leather or fur. How amazing is that?! Buying gifts for women seem to be easy. 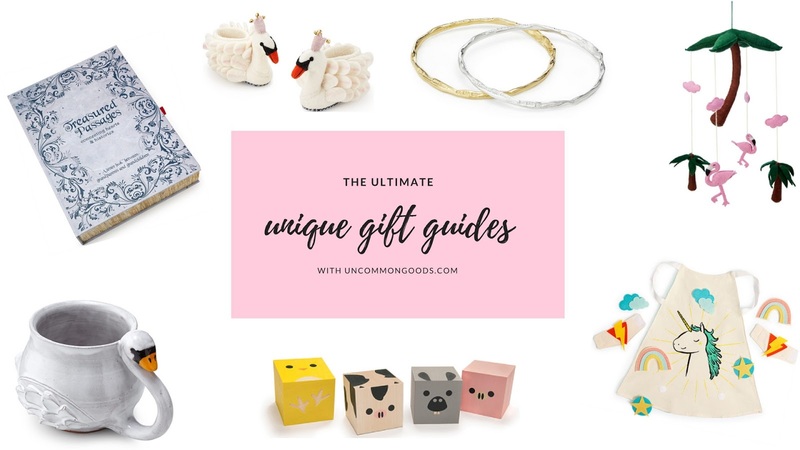 But if you want something more long-lasting than a box of chocolates, and less predictable than a bottle of perfume, UncommonGoods has a solution for you! If she likes statement jewellery, get her something as special as the Raw Emerald Flower Cuff. Or the She Believed She Could Bangles if she likes more minimalistic pieces. The Ripple Earrings are my favourite. They are so classy and sophisticated. Green malachites are incredibly beautiful. The Swan Mug is gorgeous. All women would love to receive it! It will look amazing held by an artist, sipping her green tea between the painting sessions. Aesthetically pleasing, will be appreciated by a chic woman, as well as brave girl-boss. A teenage girl will say that this is the coolest mug ever! And it will, filled to the top with coffee, help her get through a tough exam period! Emerald green is one of my favourite colours, so when I saw this gorgeous Tidal Shift Print in Emerald Green, I immediately fell in love with it. This piece will look incredible in a minimalistic interior. 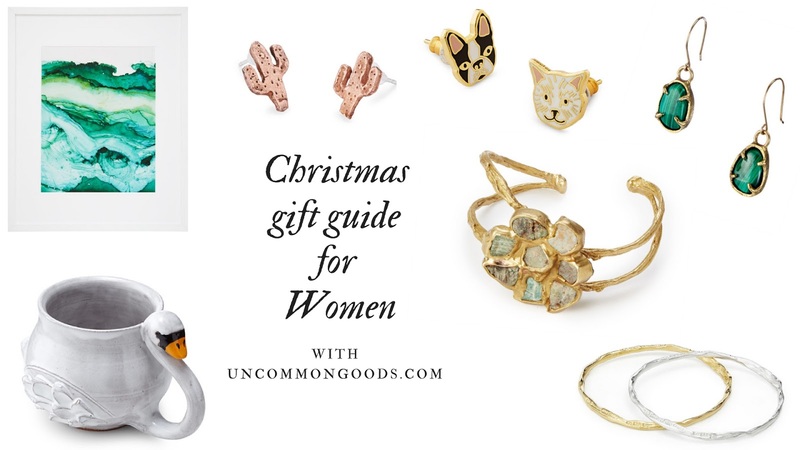 For a woman, who likes to spice up her outift with cool jewellery, I would go for Cat & Dog Mismatched Earrings, or the Bronze Cactus Earrings. Both pairs are very unique, and affordable too! I am sure that I am not the only person who always struggles to find something unique for men! 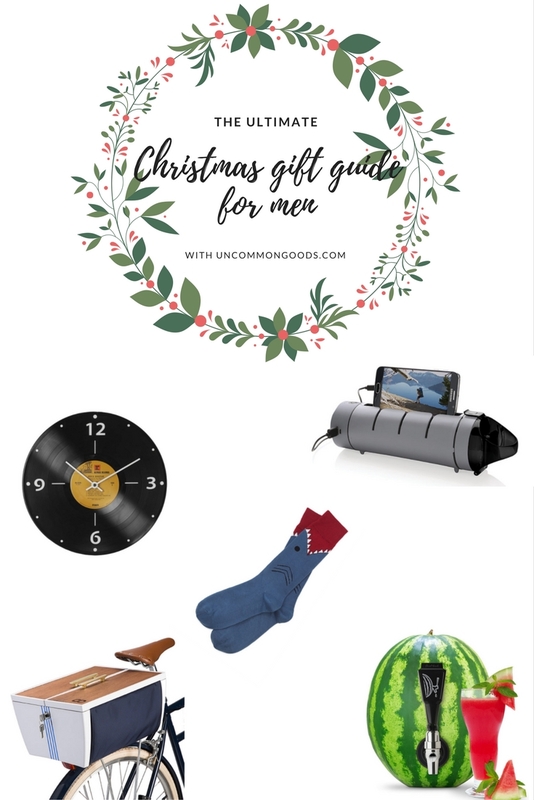 If you have no clue what to get your husband/ boyfriend/ dad/ brother, definitely check out the whole range of products for men offered by Uncommon Goods. Record Clock- it is a perfect present for a music fan! And you know what is best about it? Everyone loves music! The clock is handmade by an artist, and you can choose from the pre-selected Rock, Soul, Jazz or 80s albums. Phone Charging Water Bottle and Stand- because staying hydrated and having the phone charged is important! If he likes to ride a bike, and you can splurge a little, get him a Bike Boot Bicycle Storage. Fruit Keg Tapping Kit- very practical and reasonably priced! Does it remind you of that scene from 'Grace and Frankie', when Grace was making the watermelon vodka? Forest Friends Stroller Toys- the squirrel and skunk duo is cute and soft. Perfect little friends for your little human! Little Adventurer Socks- set of six pairs of slip-resistant socks. They're cute, comfy and unisex. Personalized Wooden Baby Bunting- perfect not only for birthday parties but also as your baby's bedroom decoration. Organic Cotton Teethers Veggie Crate- teething is not a fun time neither for baby nor for the parents. But these gorgeous Veggie Teethers will help you to get through this difficult time smoothly. Farm Animal Blocks- I do not know a baby who doesn't like farm animals. These cute blocks will help to boost your baby's imagination and develop their motor skills. Little Animal Lover Closet Dividers- A perfect gift for new parents! It will help them to organise baby's wardrobe. And trust me- organisation is the key when the baby arrives! Personalized Book About Space- an obvious choice for me! Every child (and almost every adult) will be excited to go on a galactic tour! Swan Slippers- beautifully designed and perfectly executed, swan slippers will be a perfect choice for every little girl! Garden Plate & Utensils- a great dining set, which will make eating meals much more fun! Make Your Own Kaleidoscope- I used to love kaleidoscopes when I was a child! They're so unique and out of this world. How fun would be to build it up from scratch?! Jetpack Backpack- this unique backpack will be a great reminder for your kid that imagination can take him everywhere! Build Your Own Robot Set- yet another creativity- boosting toy! Or- toys, as this set contains parts which will allow your kid to build 3 robots, or whatever else he imagines! Magical Unicorn Cape- unicorns are fascinating, but unicorn-themed stuff can sometimes be a little tacky. But not this one! This cape is absolutely gorgeous. See more ideas for kids here. Bonus! Something very special. 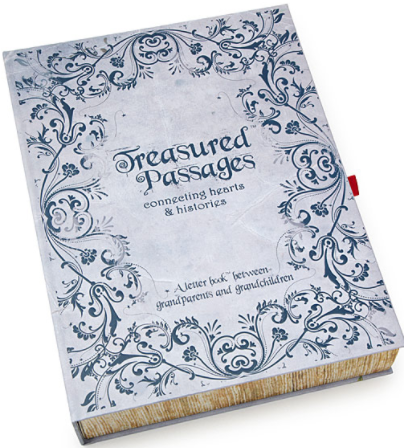 A beautiful letterbook, which comes with a set of 40 cards for grandparents and their grandchildren to send to each other. A phenomenal gift idea! Birthstone Wishing Balls- these unique wishing balls are hand-blown. The are available in 12 colours, and each of them comes with 52 slips of paper. You can write your wishes on them, favourite quotes or memories, and tuck them into the ball. I would personally use them for practicing gratitude. They are breathtaking! Personalized Constellation of Love- what is the day that you want to remember forever? The computer will plot the star charts, and the artist will illustrate that night's sky. I don't know if a gift can get any more romantic than this! Scratch Map Deluxe- a perfect gift for a globetrotter. It will allow him to scratch off the places he already been to, and get excited to travel more! My Life Story- So Far- a very special journal that you can fill in with your memories and gift it to your child. Which item was your favourite? 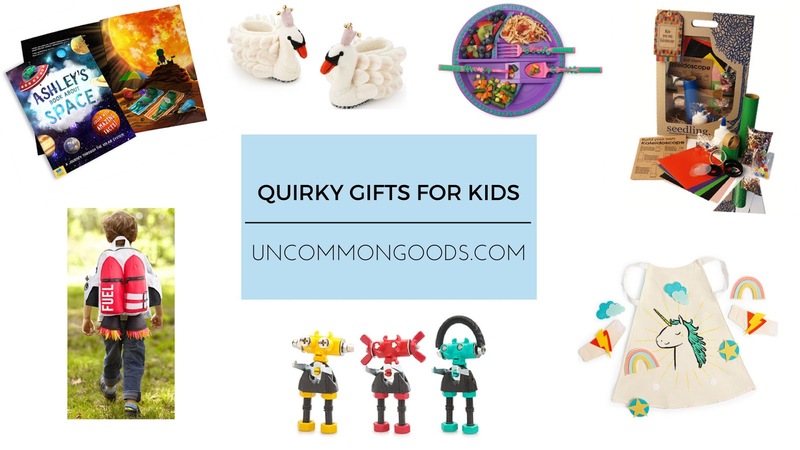 What would you order from Uncommon Goods? Let me know in the comments below 🙂 Thanks for reading! I love Cat & Dog Mismatched Earrings! Lovely items here. That record clock looks amazing! These products look awesome, will definitely be hecking out this site for some of my more difficult people to buy for! What a lovely round up! I love that these are so different from the norm - I'd definitely go for those earrings. 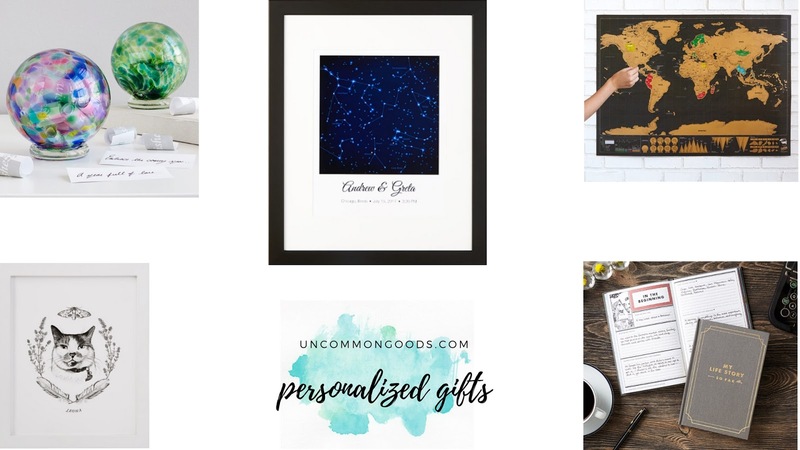 I love finding unique places to buy quirky gifts, so I'll definitely have to check out Uncommon Goods. My favourite picks are the kaleidoscope kit and the swan slippers! Uncommon Goods sounds amazing and my mummy likes all the cute earrings! <3 so happy to hear that! Love the items here. They look great. I have used Uncommon Goods before. The odd ones, the good ones are not the daily life things but certainly the most memorable or sovereign thing we can gift to some person. For e.g. tiara for teenage girl, magical or superhero outfit for child, wonderland books and anything which is beyond the person's comprehension.